That’s why we can be counted on to provide resources that lead kids to Jesus, providing fun Bible lessons and activities that help children apply Biblical truths to their daily lives. Gospel Light Sunday School Curriculum is easy for teachers to plan and implement, giving them more time for what matters most – building relationships and instilling God’s truth in tomorrow’s Church. Gospel Light’s curriculum has become a part of the David C Cook family of Sunday school resources! We are thrilled to be a partner in ministry with you. Gospel Light has a long and rich spiritual heritage. 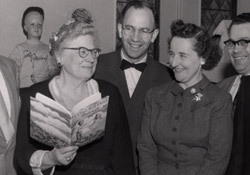 One of the 20th century’s greatest Christian educators, Dr. Henrietta Mears, began the organization out of her garage in 1933. Her teaching and the Sunday school curriculum she developed influenced leaders such as Bill Bright, Richard Halverson, and Billy Graham. Much like Gospel Light, David C Cook has been serving the local church for generations. Since David Caleb Cook founded the organization in 1875, David C Cook has reached over one hundred million adults and children around the world with life-changing Sunday school resources. We’re excited to see these two organizations come together to serve you from Colorado Springs, Colorado. David C Cook is committed to serving you with the same Gospel Light curriculum you use and love today. We are honored to continue the tradition of biblically focused, child-centric materials that Gospel Light has upheld for over 80 years. We see it as a privilege to serve the local church on a global scale alongside you. If you have any questions, comments, or concerns for us, please don’t hesitate to call our toll-free number, 800-446-7735. We are standing by to make this transition as simple as possible for you. Thank you for the loyalty you have shown to Gospel Light over many years. We are grateful for our partnership with you and we look forward to equipping and serving you as you serve the church.